Our customers can avail from us a wide range of Variable Contact Thermometers. These thermometers give high performance and gives higher output to our customers. Based on modern technology, these are demanded by our customers not only in India, but also in foreign country. Our customers can avail these at market leading prices only from us. - Features rugged, ergonomic design that stands up to tough industrial, electrical, and mechanical environments. Overview With a rugged, easy-to-use, ergonomic design, the Fluke 568 two-in-one contact and non contact thermometers can stand up to tough industrial, electrical, and mechanical environments. - 1 meter cable, alarm facility for max. min. Technical Specifications Non- Contact Temp. Range : – 76 to 1832 F ( -60 to 1000 C ). - Field of View – 50 : 1. 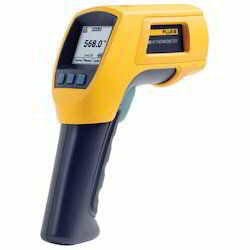 - Features Both Infrared and contact thermometer technologies. - Includes programmable HI / LO alarms.